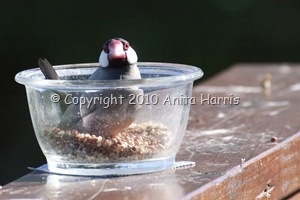 I’ve been putting a bowl of seed out onto the deck every day, and over the last couple of weeks, lots of birds have been discovering it. Its getting a little busy up here now. Visitors to the bowl include a family of Java Sparrows (a parent is pictured here), a pair of Red crested Cardinals, 3 Red Cardinals (two males and one female), the odd brave House Finch and a daring pair of Minor Birds. 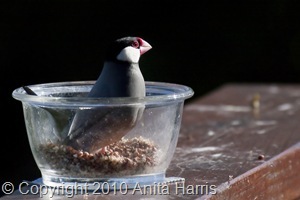 The Java sparrows are getting very tame, and aren’t even disturbed from their bowl of seed when I go outside to take photos of them. 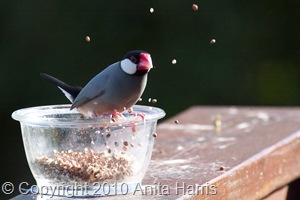 I’m waiting for the Red Crested Cardinals to get a little more used to me, so I can blog about them too.